Handy Password is an easy-to-use password organizer and password manager that helps you better operate with your passwords while surfing the web. Why do I need a password organizer? Today Internet offers a vast variety of services including email, chat rooms, forums, blogs etc. While surfing the Web you can open accounts, purchase goods and services, communicate with people online etc. To do all of the above mentioned, you often need to go through the process of authentication i.e. submit your password to enter. Having to operate many passwords on a day-to-day basis brings with it a number of problems. To start with, passwords tend to be forgotten especially if they are many. Moreover, weaker passwords can be compromised, thus someone can steal your password and use it to their advantage. 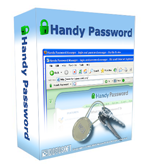 To avoid this and many other problems, including those associated with password security, we suggest that you take advantage of our proprietary password organizer, Handy Password. It securely stores all your passwords grouped by categories such as email passwords, shopping passwords, forum passwords etc. in a special database which you can keep on the email server and access at any time from any location. What are the benefits of the password organizer? With a password organizer, such as Handy Password, you neither need to remember nor type your passwords. The program will automatically determine which password is required for this or that service and enter it to the space provided. So you may totally forget about the whole password management issue and enjoy the process of easy browsing! Download password organizer Handy Password.